Maybe you have a bike that’s not starting, or maybe you want to make sure your bike doesn’t get to that point. Whatever the reason, you’ve come to the right article to learn how to check your battery’s health. 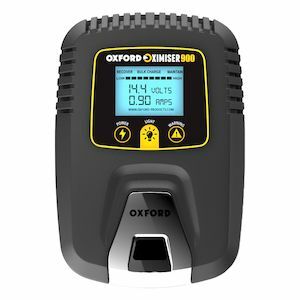 There are a few tests one can run just on the battery, rather than the whole charging system, with a variety of tools. Note that there are a number of tests and tools available on the market, and very few comprehensively test a battery. Fortunately, common sense and a few checks ferret out most battery problems pretty easily. We’ll move in order of difficulty first, which coincides with the cost of test equipment necessary. Oh, the culprit might be a bad battery. But maybe it's not the one you suspect. Did you know your key fob (if equipped) might use a battery? It's a good idea to check non-battery issues before you start ripping a bike apart. RevZilla photo. Is your sidestand up? Is your clutch pulled in? Often on modern bikes there are electrical switches that will not allow a bike to start if these two conditions are not met. Is the bike’s key in the ignition position? These not battery problems, but they will mimic the problems a bad battery displays. Mechanics never describe a starting problem as “not running.” Starting issues are either “no crank” or “no start.” If the bike’s starter sounds like it’s turning over the engine at the appropriate speed, odds are good your no-start condition is not a bad battery. Though your bike’s electrical system is pretty complex, the starting system really is not. Cranking issues are often battery related. Starting issues are usually not. Here we have the two main styles of multimeter. On the left is one of my personal Klein auto-ranging meters. This type of DVOM will "figure out" the voltage scale on its own, so to test a moto battery, all I have to do is turn the knob to the "V." On the meter to the right, the RevZilla house junker, I have to select the scale, so it gets turned to the "20" scale on the voltage portion of the meter, which is indicated with (surprise!) the green "V." Note that on both meters the black lead is plugged into the COM ("common ground") port, and the red lead goes to the voltage port. RevZilla photo. Batteries need both voltage and current, but testing voltage is easy — all you need is a multimeter, also known as a DVOM (Digital Volt and Ohm Meter). Plug the leads into the multimeter. The black lead will go into the port that says “COM” (common ground) and the red lead will get plugged into the port that has a capital “V”. Turn the multimeter on to the 20V DC section of the scale. (If you have an autoranging meter, just go to “V,” because you won’t have a scale.) With the bike completely turned off, touch the black lead to the negative post of the battery, and the red lead to the positive post. Record the voltage. Touch the negative lead to the negative post, and the positive lead to the positive post. Nope, you won't get zapped — unless you let something bridge both terminals, then you'll get burned. RevZilla photo. 12.73 or better 100 percent. Go ride. 12.62 90 percent. Charge it, then go ride. 12.50 80 percent. Charge it, then go ride. 12.32 70 percent. Charge it, then go ride. 12.20 60 percent. Charge it, then go ride. 12.06 50 percent. Charge it, then go ride. 11.90 40 percent. Try charging it, but it might be toast. 11.75 30 percent. Try charging it, but it might be toast. 11.58 20 percent. Battery has converted to doorstop. 11.31 10 percent. Battery has morphed into boat anchor. 10.50 No meaningful charge. Check to see if battery has been replaced with rock. Note that most of you will stop here. You’ll probably find that your battery is shot. You can attempt to charge the battery, possibly with good results, or you may also want to look into replacing the battery. Note the tacho in the background. This bike is passing its cranking test with flyin' colors. RevZilla photo. You can perform a test with the battery under load (working) to get an idea of the current flowing through it. Note that this isn’t the “right” way to do this, but it’s another clue to help you confirm or deny your battery’s health. Hook up your DVOM in the same manner you did for the standing voltage test, and have an assistant thumb the starter. While the starter is spinning, observe the voltage. The starter should be running at normal speed. 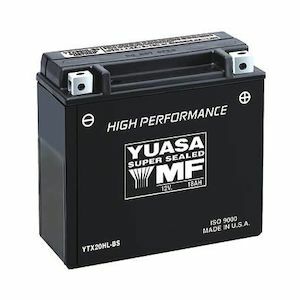 A good battery should not drop below 9.6 volts over 10 seconds or so. If you have a load tester (a "toaster," so named because electrical energy is converted to heat, making the device quite warm when in use), now is the time to use it. Performing current tests is largely dependent on the style of tester, so I will refer you to the instruction manual for your tester. These are generally more progressive than the “go/no-go” nature of the cranking voltage test. The carbon pile mimics an actual electrical load. It hooks up, and the operator presses a spring-loaded button to apply a load of a known size to observe the battery’s behavior. Can't do better than that. One item of note: That voltage seems a mite high. If you see something like that right after you charge your battery when re-testing, you might want to turn the headlights on for 30 seconds or so and re-test, because batteries can keep a superficial "surface charge." RevZilla photo. If the battery was weak, charge it and perhaps look into why it might be weak. If the battery was bad, replace it. If you charged the battery, re-check it! Of course, maybe it was just cold and you forgot to hook up your battery charger. Or perhaps your stator is getting weak and can’t supply your battery with enough juice to charge. Maybe your voltage regulator ain’t regulatin’. Who knows? I can tell you this much, though: Ignoring the issue won’t work for very long, if at all. Find out why your battery went bad! That's as good as it gets, in my book. This battery (and bike!) are ready to go. RevZilla photo. Remember too that a battery that is only just passing these tests is likely to get worse quickly. Sometimes replacing a battery is financially painful, but the right thing to do. If you’re setting out on a cold fall ride, for instance, that battery might just shoot craps at just the wrong time. Do you want to gamble that the tow-truck operator you rely on has a flatbed and knows how to load and strap down a motorcycle without damaging it? Is a tow cheaper than a battery? Also remember that charging system components are pretty expensive, and the labor to get to them is, too! Bad batteries place a heavy burden on a bike’s charging system. 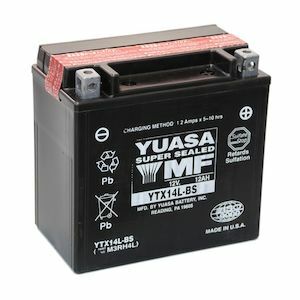 A $100 battery pales in comparison to the $500 you might have to spend to replace a stator that your battery wiped out. Hopefully, you learned a few things and assessed your battery’s state of charge accurately. If you need any further help, drop a comment and either I’ll try and help you along, or one of our other helpful readers will jump in.